Arp 147 contains the remnant of a spiral galaxy (right) that collided with the elliptical galaxy on the left, producing an expanding wave of star formation that shows up as a blue ring containing in abundance of massive young stars. These stars race through their evolution in a few million years or less and explode as supernovas, leaving behind neutron stars and black holes. A fraction of the neutron stars and black holes will have companion stars, and become bright X-ray sources as they pull in matter from their companions. The nine brilliant X-ray sources scattered around the ring in Arp 147 are black holes, with masses that are likely ten to twenty times that of the Sun. An X-ray source is also detected in the nucleus of the red galaxy on the left and may be powered by a poorly-fed supermassive black hole. This source is not obvious in the composite image but can easily be seen in the X-ray image. Other objects unrelated to Arp 147 are also visible: a foreground star in the lower left of the image and a background quasar as the pink source above and to the left of the red galaxy. Infrared observations with NASA's Spitzer Space Telescope and ultraviolet observations with NASA's Galaxy Evolution Explorer (GALEX) have allowed estimates of the rate of star formation in the ring. These estimates, combined with the use of models for the evolution of binary stars have allowed the authors to conclude that the most intense star formation may have ended some 15 million years ago, in Earth's time frame.. 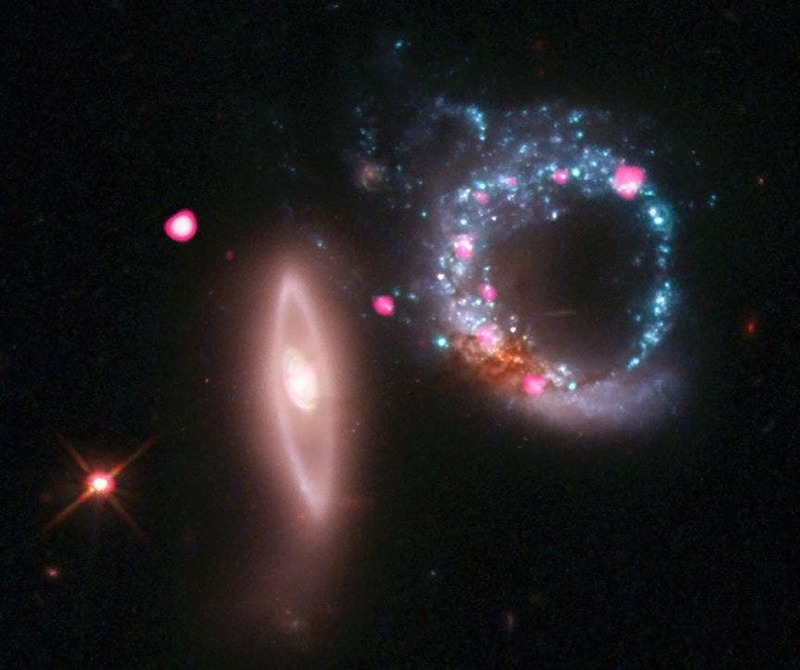 Image at top of page: This composite image of Arp 147, a pair of interacting galaxies located about 430 million light years from Earth, shows X-rays from the NASA's Chandra X-ray Observatory (pink) and optical data from the Hubble Space Telescope (red, green, blue) produced by the Space Telescope Science Institute.